Be an everyday hero who can fix anything when you wear this ruggedly stylish piece of multifunctional gear. 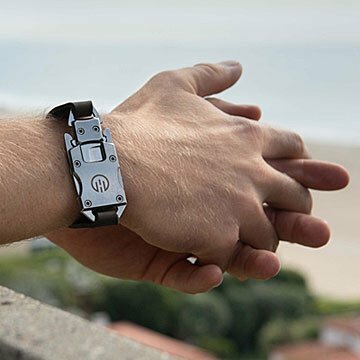 Tackle everyday life with competent aplomb when you wear this handsome multi-tool bracelet. One click, and out pops a multi-functional knife with a flat head screwdriver on its tip. Because it's always within reach on your wrist, it's the ultimate handy tool. Open packages, slice an apple, fix a bike on the fly; it can do a little bit of everything. Made of precision-crafted, rust-resistant stainless steel, it will last for many years, adding a cool, rugged touch to all your casual and sporty looks. Neoprene band handmade in California. Stainless steel components made in China.